How’s this for a statement? TBS has bumped this Sunday’s Phillies-Red Sox game in order to air Stephen Strasburg’s second start. Those are two teams that have each won the World Series in recent years and that have name recognition and star power to draw viewers, whose interleague game has been pulled so that the network can show Strasburg’s start against Cleveland. Thanks to Richard Deitsch for tip on this one. It’s hard to predict how Stephen Strasburg will do in his major league debut tonight for the Washington Nationals, but I think it’s safe to say that the TV ratings for the broadcast on MASN will break records for the five year old regional sports network. As of that May MASN posting, “television ratings for the Nationals [were] up 43 percent over the same period last season” with them team “earning a 1.0 household rating, as more than 20,000 households in Washington tune in nightly.” Last Monday, a Strasburg start for AAA Syracuse, that was broadcast live on MASN, peaked at just shy of that average with a 0.9 rating, according to the Washington Examiner. One tiny factor to consider tonight regarding the TV viewing audience is that more than 41,000 people will be at the game. That’s well above the team’s average attendance of 21,559 through 27 home games this season. But the hype is so big for Strasburg and this game, that will likely be just a drop in the bucket. MASN should see some through-the-roof ratings tonight. June 4’s got to be feeling a little slighted right now. That was the day that many in the media speculated would be the major league debut of highly-touted pitching prospect Stephen Strasburg, which caused a run on tickets for the Friday night game against the Cincinnati Reds. Then the team made the official announcement that Strasburg’s first game would be June 8, meaning June 4 is simply a Friday night game that a much larger than average number of people now have tickets to. Something special could still happen at Nationals Park that night (throw a no hitter, Livan! ), but why leave that to chance? There’s a way the Nats front office can restore a little dignity to that date and ensure that game has meaning again for some of the fans who still choose to attend — Let Teddy Win! 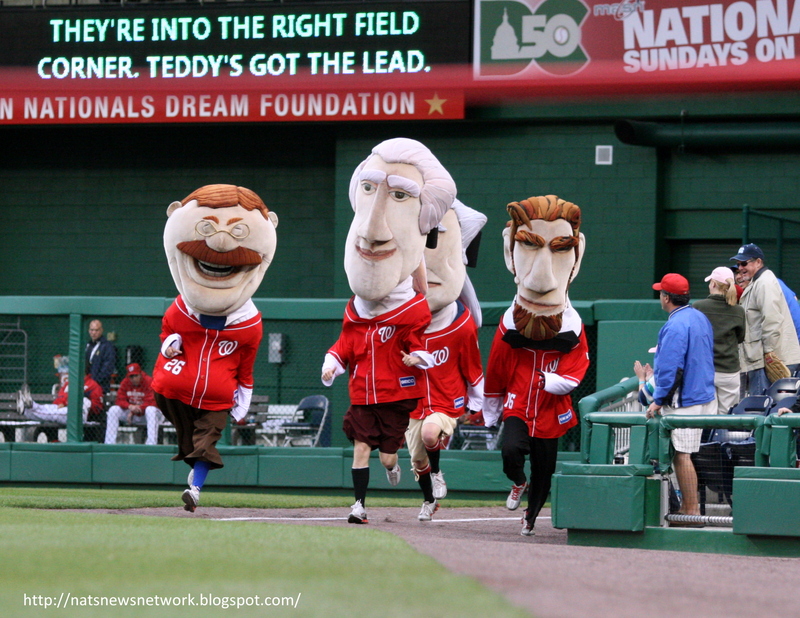 Whoever came up with the idea to have Teddy Roosevelt never win the Presidents Race at Nats games is a marketing genius. I don’t know if that was the plan from the beginning or if Teddy just hadn’t won one of the first few races and the marketing team decided to keep it that way, saving it in their back pocket for a special occasion. Or maybe the plan is to have Teddy never, ever win. Regardless, it’s become a part of Nats subculture and it’s brilliant. The Nats don’t owe anything to anyone who bought tickets to the June 4 game on speculation that it might be Strasburg’s MLB debut. The team never made any official statement about when he would debut until naming June 4-6 and June 8-10 as possible dates last week, and then coming out with the June 8 announcement this week. But it never hurts to pleasantly surprise your customers. Granted, a Teddy win is not in anyway a Strasburg debut, but it’s still something that some will proudly say they were there in-person for. Really, other than an amazing on-field performance, what better way is there to reward those in attendance for this non-Strasburg start than with something that’s just as rare as Pitching Jesus? Perhaps the Nats already have Teddy’s first win planned for some special occasion down the road. If not, I hope they’ll give a June 4 Teddy win some thought. Teddy would finally get to have his day and June 4 would get to feel special again too. It’s win-win — and then Teddy can go right back to losing every race.